We return to Wessex for the Christmas celebration where King Aella, King Eckbert, and Queen Kwindreth are together with friends and family. 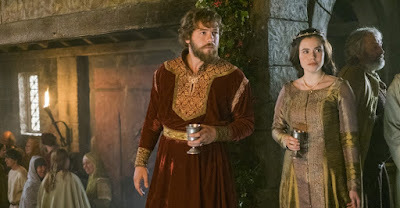 We see a furious King Aella about Magnus, and his own daughter Judith. Although King Aella sees the treason from Eathelwolf and Kwindreth he takes Judith to discuss his anger. Judith tells him that she is free and he can't stop her. King Aella announce that he will kill Ragnar for what he did in Northumbria. 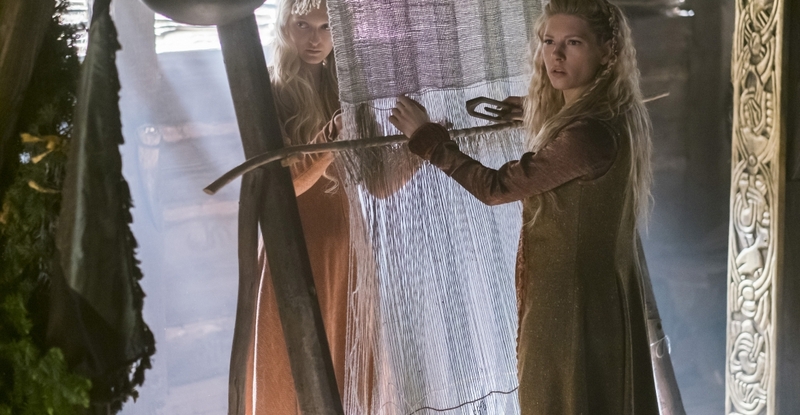 When we return to Kattegat to celebrate Yule we see a lot of things happen. Yule* starts when the Arra Geola moon is there to grow full in late November or the first weeks of December. Yule has to do with the wild hunt, and Odin associated with Yule, and the german Pagan Mōdraniht (Christmas eve now). 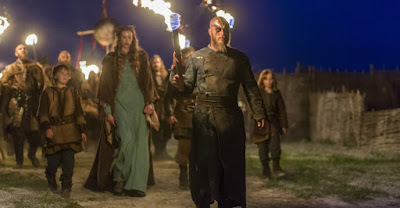 We see the fire lighting by Ragnar this is Yule Log but the Yule Log is also the wood brought in the great hall in this episode. We see a crow in front of the parade is announcing the moon but I think it is a hint to Odin as well. We also see Floki who went to the seer^. I still believe Floki = Loki. Recently I doubt that he could also be the next seer. There is always something mythic about Floki but I like the mysterious ways he believes in. What we now know is that Floki will be hundreds of years old because the seer told us. It has more Loki than seer but you never know with Floki. In the new podcast by History Channel itself, they interviewed Gustaf Skarsgård who plays Floki. He can't tell but Floki could be anyone he could be Loki or a new seer. One thing we know is that he will get a difficult season ahead. He tells that people will die but if his Floki dies he kept in mystery just like his character Floki. We finally see the old Floki back. 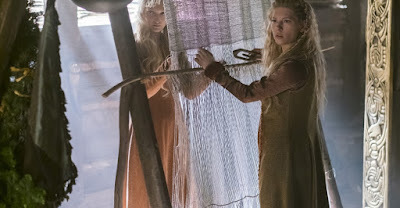 The interesting part is Aslaug wants Ivar to get educated by Floki in the old ways. Floki knows Aslaug could be an ally in the future. Everyone saw Bjorn fighting with the berserker. I think Bjorn knows exactly who send him by presenting him the ring. When he is catching Torvi at Lagertha and Kalf, Erlendur is taking the child from Torvi. I don't know why but I have the feeling Lagertha knows exactly who is behind the attack as well. Last but not least we have a very peaceful Christmas celebration in Paris. I do think they finally meet each other after the last episode. What is funny about this scene is that everyone can enjoy from the meal. There are some of them that will have mixed feelings when this scene happened. Most of all we see almost everyone smile. The surprise of this episode we need to find in #King Finehair the stories spreading about Ragnar took him to Kattegat. Aslaug doesn't believe him. After he plays a game with the boys Hnefatafl.$ He tells her the truth about a princess he wants to marry. I was thinking about what I said earlier and I believe he wants to marry Yidu although it could be Aslaug as well. He wants to marry her when he is King of all Norway. At the same moment, we see that Bjorn made it in time to celebrate Yule with Torvi and Ragnar also comes to the great hall. You can see him thinking what is he doing in my chair. Ragnar isn't too friendly to Bjorn as well.